Pricing has been released on the 2010 Lexus HS250h, the first dedicated hybrid from Toyota's luxury division. The not-Prius starts out at $34,200 for the basic model and $36,970 for the Premium model. The HS250h will be coming in well above the Prius, but rightfully so, it's a considerably more luxe offering and gets things done in the handling and driveability department in a way the Prius just doesn't. It also gets several new Lexus systems including Safety Connect, the Lexus version of OnStar. They'll be hitting dealers next month. • Best Combined EPA MPG Rating of Any Luxury Vehicle in the U.S.
include a delivery, processing and handling fee of $875. the U.S. and its MSRP is nearly $10,000 less than one of its entry luxury sedan segment competitors. 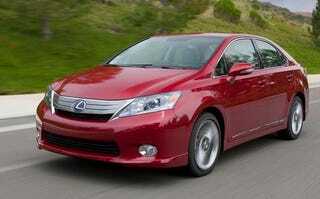 customers and hybrid technology," said Mark Templin, Lexus group vice president and general manager. standard class-leading 10-airbag Supplemental Restraint system and front active head rests. 187 total system hp. HS 250h has nearly zero evaporative emissions. service that is included with an XM® satellite radio subscription. cooperation with the LDW function and the dynamic radar cruise control. Premium Surround Sound system with 15 speakers and 330 watts, and the Park Assist Package. An all-new telematics system, Lexus EnformTM with Safety Connect TM, available by subscription will also be available on HS 250h. Complimentary one-year trial subscriptions of Lexus Enform and Safety Connect are included with all new HS 250h purchases. One-year renewal subscriptions to Safety Connect alone will be available for $139.95 and to Lexus Enform with Safety Connect for $264.90 per year. Multi-year subscriptions will also be available. The Lexus Enform and the Safety Connect response center operates 24 hours a day, 7 days a week – every day of the year. GPS data to the already included warranty-based Lexus roadside service. business by name, or a type of business (e.g., gas station, movie theater, etc. ), and even Zagat ®-rated restaurants, and then send the coordinates to the navigation system for routing. With eDestination, drivers can go online via LexusDrivers.com to save and sort destinations in up to 20 folders, each holding as many as 10 destinations. Then drivers can send the locations – up to 200 at a time – to their vehicle, where they will be available for download into the navigation system. Online, drivers can create personalized location names (e.g., "Favorite sushi," "1 PM Appt," "Kids' doctor," etc.) and even list notes about their saved locations – all helping them see exactly the information they choose in the vehicle. equipped HS 250h vehicles is launching at the same time as Lexus Enform. This feature offers in-vehicle audio casts that provide owners access to useful vehicle tips and event information, and insights into exclusive owners' benefits – all designed to further enhance the Lexus experience. As part of the all-new Lexus EnformTM navigation platform, the HS 250h also features XM NavTraffic®, XM NavWeather TM , and XM® Sports and Stocks services. XM NavTraffic® and XM NavWeather TM are available via individual XM subscriptions while XM® Sports and Stocks is included with an XM® Radio subscription. XM services offer a 90-day trial.